After over three years of community outreach culminating in the recent community design process where SF Urban Riders partnered with Alpine Bike Parks and SF Recreation and Parks, it’s looking like McLaren Bike Park is going to happen. But… to take it to the next level, we need to pay for the design phase of the project, show that we can raise money, and prove that people actually want a bike park. This will help us apply for larger grants and ultimately fund the entire MBP Project. For those individuals that want a bike park, this is the chance to show your support. Maybe you haven’t made all the meetings. Or, maybe you haven’t been out to all of our events. Well, now there’s a great way to show your support and let everyone know that “Cyclists in San Francisco want McLaren Bike Park!”. Become an MBP Founder!!! What you give: Tax deductible donation of $100 or more. Thanks and bragging rights! You helped get the bike park started. An MBP Founders facebook badge. Your name on the MBP website. Ultimately have your logo/name visibly ackowledged at McLaren Bike Park. Did we mention you get a free t-shirt? What you give: Tax deductible donation of $300 or more. An MBP Founders badge for your website and facebook page. Your shop name on the MBP website. Ultimately have your shop name visibly ackowledged at McLaren Bike Park. What you give : Tax deductible donation of $1000 or more. Your company name and logo placed on the MBP website. Ultimately have your company name physically acknowledged at McLaren Bike Park. Shortly thereafter, you’ll be added to the founders list here. If you want to pay by check, please make them out to SF Parks Alliance, and note SF Urban Riders / McLaren Bike Park Founders Club. Mail to: SF Urban Riders c/o Dustin Smith, 221 Warren Dr., San Francisco, CA 94131. Or if you’re in the bay area, email me, and I’ll come pick ’em up! Click here for the form to donate by check. 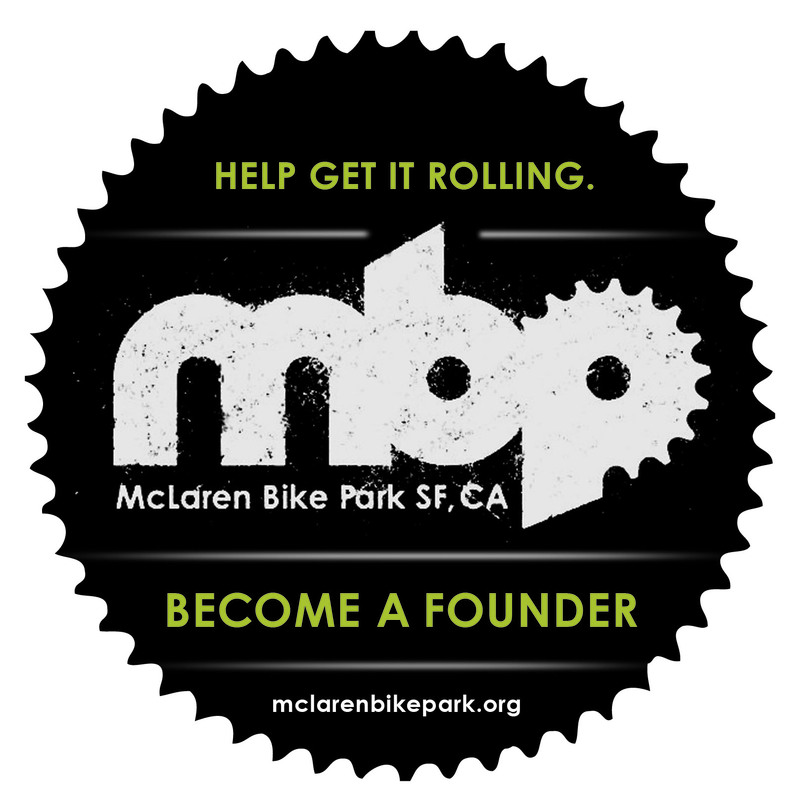 75% goes directly to McLaren Bike Park Design and Development. 20% to the SF Urban Riders general fund for operating costs and youth programs. 5% to SF Parks Alliance, SFUR’s non-profit fiscal host. For more info contact dustin@sfurbanriders.org. ← What you could be riding!!! That new park design that was in the email was pretty sweet. Can we get a closer look? Next step is raising some money (become a founder!) and hopefully you’ll be riding it in 2012!!! What is the total fundraising goal? BTW, I saw your fundraising page (linked from FB) and it looks great, I would suggest linking back to this page or having more info on that page about the plan.